Image courtesy of the designer. Designer Yuna Baek collaborating with Brooke Collins. Yuna is our first designer featured in Knotwe Making It. She worked in collaboration with Brooke Collins investigating various techniques to seek out contemporary approaches to leather work. Yuna answered the Knotwe Making It process questions outlining how Brooke and herself through research and experimentation created their own fresh approach to leather. The concept for my leather works comes from the process itself. My interest in leather came from never being formally taught much about the material in art school. We were constantly learning about wood working, mold making, and working with plastics, and I realized that as designers we were completely ignoring soft materials. 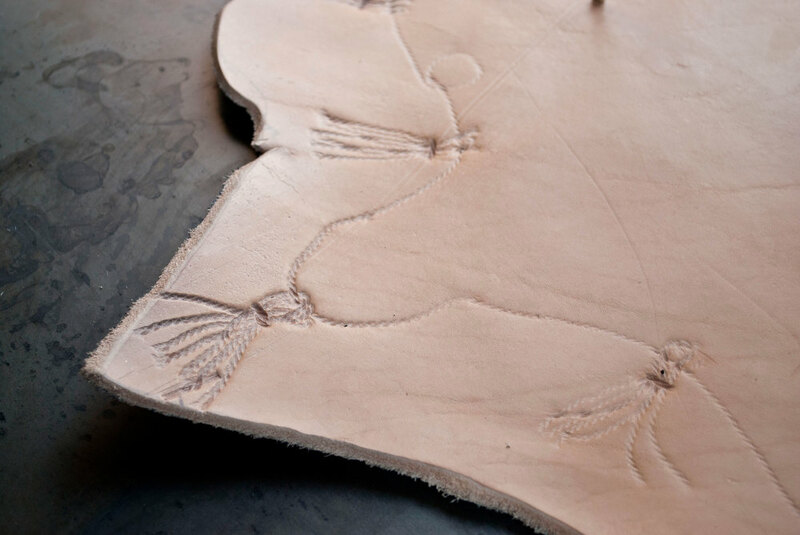 When I began to research leather working I realized it was going to be a long and hard process. Most of the information online I could find was about forming gun holsters and leather masks; I couldn't find many people doing new things with the material in the art or design world. My collaborator and I were overwhelmed and we decided to make it easier by focusing on super basic manipulations. Fold. Press. Shave. Emboss. We took basic knowledge from the sources we could find online, like making leather malleable using warm water, and combined it with manipulations we already understood. A turning point for us was when we realized we could use our CNC knowledge to make wooden molds that we insert the leather in and use a hydraulic press to press in shapes and textures that were permanent. This allowed us to change the appearance of the leather, while in our opinion, keep the integrity of the material. For another piece we taped off designs on hair-on hide calfskin, and using a beard trimmer, shaved areas to let the natural color of the skin show through, enhancing the beauty of the material. 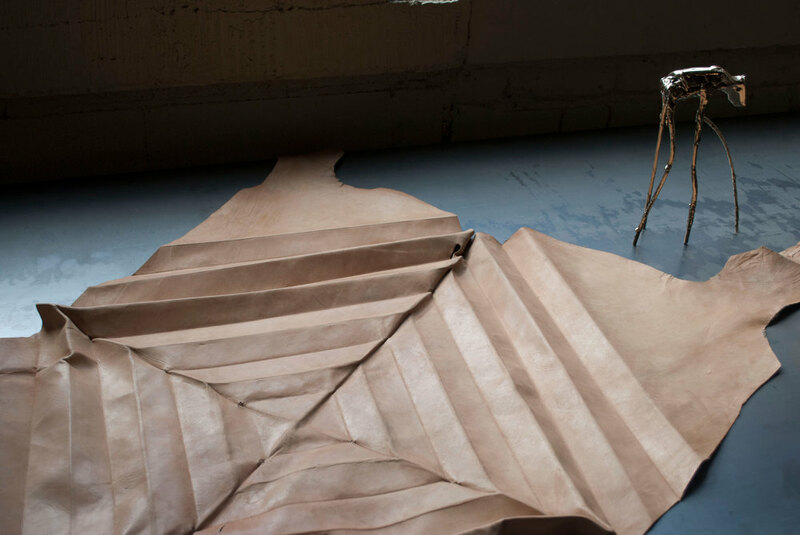 Our favorite piece, Fold, was made by soaking a veg tan calfskin and and clamping in folds that we created by hand and allowing the leather to dry. After this we sewed in tiny stitches holding each fold in place. Images courtesy of the designer. The primary material in this series is leather. We used very little other materials, mostly a few inches of thread and warm water. We wanted to create the biggest impact without covering the leather with outside materials. The leather is so beautiful in itself, and comes in so many textures and colors. We just wanted to enhance that and show the range of manipulation possibilities. Our first step is always seeing what leather is out there. The material really dictates what process we use and what process we can come up with. We sit with the material and play with it, test what it can do, if it will hold folds or textures, etc. I think leather is the kind of material that tells you what it wants you to do to it, and it is just about taking the time to read it. Image courtesy of the designer. When we started working with leather, there were many hurdles. We had no proper education on the material and both of us struggled at first with sewing and other technical problems. We have so many hides with failed experiments, pressings that didn't work, and tests that never amounted to a final piece. But this trial and error was what brought us to the methods we are working with today. The confusion on what kind of leather to use, what can be molded, what temperature of water, how to long soak each piece is what brought us to the concept of using basic manipulations that we could wrap our brains around. We might not know what this leather is supposed to be used for but we knew that we could fold it. We knew that we could shave it to create designs that brought out the inner beauty of the skin. The hurdles brought us back to basics in a sense, and it helped us build confidence in what we were doing. Images courtesy of the designer. Far right image features Brooke Collins who collaborated with Yuna. After doing a series of manipulation tests, we would decide what process was best suited for the material. We would have a table full of tiny scraps with different textures and material applications, and talk about what we thought about them, what attracted us the most. Usually it was pretty unanimous when we came across a process that we wanted to work with. Then we would cross our fingers and set up the material. This usually meant soaking the leather in warm water and setting it up in a mold, whether it was with clamps or in a hydraulic press. Most of the the processes we use don't show us if it was successful right away, and there is an element of waiting and being surprised. This was another part of the process that interested us so much, the idea of not knowing exactly how it was going to turn out. With backgrounds as designers, usually everything was designed to the tiniest detail, and this more organic process seemed the suit the material so much more. Most of the pieces in this series are very simple and involved one single process. There are many elements that affect the final outcome that we have no control over, i.e. the color of the leather, the shape of it, the the way it drapes. We purposely didn't cut any pieces because we felt the natural shapes that came out of the tanning process were so beautiful. It reminded us of the animal itself and early uses of leather by man. It seemed natural to let the leather be what it was, and apply the smallest touch to bring out it's beauty and show our point of view. We would immediately know it was done, once we placed our small manipulation, and it didn't even cross our minds to overwork it, which is an impulse I think all designers and artists face. Currently I work in at a foundry that produces high end furniture, and at the time of this series, we happened to be having an art show. Due to the company affliction with furniture design, the pieces were immediately placed within a housewares context. We showed pieces hanging on the wall as art but also casually, draped over a chair, or used as a table runner. We thought this was really interesting and we immediately we drawn to the idea that these are pieces you can live with, and touch on a daily basis. Leather is really about being touched in my opinion, and seeing these pieces as housewares take away any pretension of art that cannot be touched. The other responses we got right away was "Ohhhhh" and "How did you do that?". I think leather is just an attractive material and people love to touch and see it, so we can't take credit for that. But I think by taking this very traditional and abundant material and adding a twist to how it is normally treated invited people to wonder how it was made and we're very excited by that. Why were you attracted to this material? 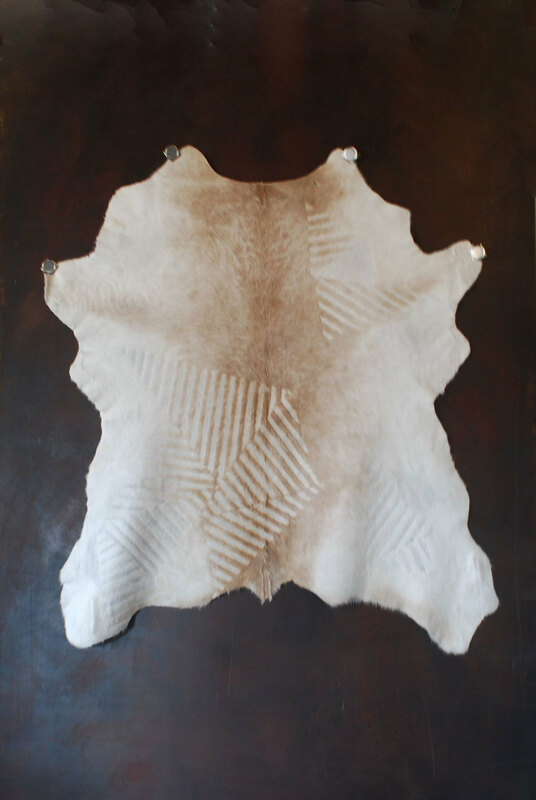 We were attracted to leather because it is a fundamental material to human development. We have been using skins forever: to clothe us, to protect us, to drink from, etc. It has a tactile quality that no human can deny. It can be soft, firm, hairy, smooth, and it feels like our own skin. It has a warmth and an attraction you don't get from hard or man made materials. We wanted to see what we can do with it, mostly just for ourselves. We both spent so many years working with wood and castable materials, it was a breath of fresh air to work with something organic, that just begs you to touch it. Yuna Baek is a designer working in Chicago. She is a member of the Fiber Textiles Surface Design Registry.